Roger Brook - the no dig gardener: Can you use fertilizer in Winter? I agonised before writing this post. In the first place is it a myth? Are there any gardeners who really believe you cannot use fertilizers in Winter? I seem to remember when I learned how to garden, vague notions of Winter fertilizer application causing soft unhealthy growth. I recall in the sort of gardening articles I only half read, warnings to put my fertilizers and liquid feeds away for the Winter. I think this advice might be appropriate to those gardeners who should also put them away for the Summer as well! I found myself thinking whether unhealthy soft growth is promoted by Winter nutrition. When plants at any time are given excessive nitrogen in the absence of other nutrients you do get extra vegetative green growth. This is not inconsequential and sometimes such growth is more prone to pest and disease. But is this problem more likely to occur in Winter? To what extent is growth promoted by nutrients at all when conditions are cold? I think there is confusion with the soft unhealthy growth encouraged by the use of too much heat in Winter. Inexperienced gardeners do not seem to realise that Winter light is often insufficient for many plants to healthily grow. I despair when I see five pound notes being burned heating greenhouses in January to enable excessively early sowings of plants for later in the year. Don’t people realise that nature makes a much better fist of heating? Sunshine comes in a neat little package, heat to make plants grow faster and light to make the sugars that are the ‘building bricks’ of healthy growth. It is no use whatsoever and positively harmful having too warm a greenhouse on a sunless January day. It would be foolish to apply fertilizer to un-cropped fallow land in mid Winter. Most fertilizers contain nitrogen in soluble form which will be wasted when leached out by winter rains and melting snow! On sandy soils that tend to be low in nutrient-absorbing organic matter, magnesium and potassium might be washed away too. This is less true of clay soils, which other than nitrogen, hold onto nutrients against leaching extremely well. I define fertilizers as concentrated sources of nutrients and draw a distinction with bulky manures and composts where much of the nitrogen is part of the fabric of the organic matter itself. Soluble nitrate will be beneficially released from manures when the bacteria get active in Spring. However, even manures and garden compost also contain dissolved soluble nitrate in Autumn and I mischievously suggest that this will be subject to Winter leaching too. Apart from wasting resources, fertilizer application to bare soil in Winter is irresponsible with regard to pollution. This is a danger when farmers fertilize large tracts of land in late Winter. We gardeners in comparison are very small beer. Unfortunately my front porch is north facing. I will mention a couple of less obvious fertilizer uses first. Lime is a fertilizer that provides calcium and in some cases magnesium. Its prime function is to elevate pH. It is normal practice to apply it in Autumn so that fairly insoluble calcium has time throughout the Winter to wash into the soil. Iron sulphate is a fertilizer as well as a moss killer on lawns. It is a valuable source of iron and sulphur. Iron sulphate is used at all times of the year. 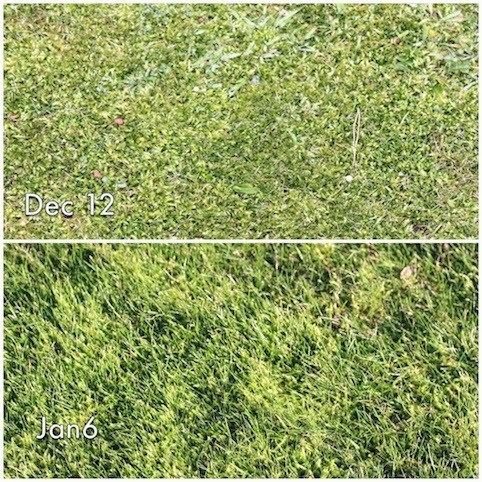 I last moss-killed my lawn on December 20th. The iron and sulphur may or may not benefit the grass straight away, but will certainly be still there when the grass starts to grow. If your lawn is more moss than grass, do not heed my advice - it will be black for a long time in a cold December and January before new grass replaces the moss. On some occasions gardeners will be potting or sowing new plants in Winter. It will sometimes be wise to use a weaker compost than in Summer. Whatever your choice the growing medium will of necessity usually contain fertilizer. I find it interesting that sometimes it is a marginal and yet a fairly inconsequential decision whether to use John Innes 1 or John Innes 2 and yet the latter is twice as strong! Plants such as my outdoor large tubs of Spring bulbs are making strong roots right through the Winter. Daffodils start root growth as early as September. It seems logical that they require Winter nutrition. If I have neglected to fertilize my pots in Autumn as I ought to, I have no reservations about top dressing them with fertilizer in Winter. I have stated before that in fertile soil there is no need to fertilize bulbs naturalised in the ground at all. It might be worth mentioning that fertilizing bulbs in pots will have only a small beneficial effect on flowering next Spring, the value of feeding is strong bulbs for the following year. I have written before about pots of Dicentra cucullaria in my collection. These will be standing outside through the Winter and their soil nutrients will be depleted by rain. The pots will contain actively developing roots in early Winter and the plants will have completed their life cycle and go dormant by early May. In my opinion the best time for me to top dress the pots with my Yara Mila compound fertilizer is in December or January. The principle I want to promote is that if plants are naturally making growth they will require nutrients to grow well. 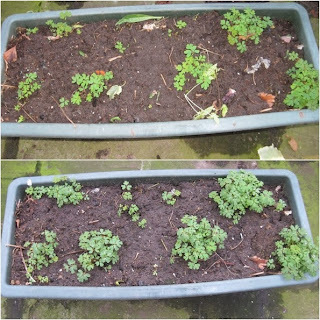 I divided and planted Corydalis flexuosa on December10th. The second picture was taken three weeks later. By early March (if our current very mild winter continues) the pot will be a solid mass of gentian blue flowers. The strong winter growth needs nutrients. Most perennial plants in the garden will be starting to make active root growth by late February - and some much earlier. Plants require nutrients for healthy strong Spring top-growth. I would expect to fertilize my blackcurrants, asparagus and rhubarb by early March. Those of you who are not regular readers of my blog might be imagining by now that I am a heavy user of fertilizer. I write elsewhere about gardening with no fertilizer at all. My comments in this piece are about the timing of applications. With a well managed soil in the majority of cases most established plants in the ground have sufficient nutrients without using any fertilizer at all. This post is not saying that you must use fertilizer. Just that you can. Part of my cold greenhouse serves to grow alpines and the pots are variously in the greenhouse or standing outside. 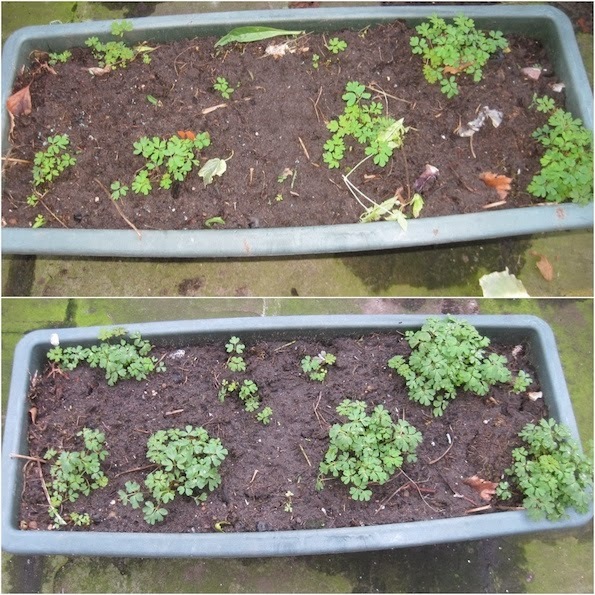 I also have tubs of Daphne mezeurium and Ribes laurifolius which burst into beautiful growth in late January. I lightly top dress at that time. The very fact that soil soluble nitrate is naturally low in Winter, means that plants may not have enough of this nutrient. Some vegetable growers give their spring-greens nitrogen fertilizer in late Winter. Personally I am not a fan of single nutrient fertilizer but in some years do make an early application of my general NPK. Our warm conservatory has acquired a solid new roof this year and the vertical east facing glass side has been raised. We eat all our meals, entertain, and generally live in this room. It is also packed with vegetation! The low Winter sun streams into this room. Most of the house plants are actively growing. Some like the epiphyllums, Christmas cacti and hippaestrums make more growth now than in summer. I posted a picture last month of my burgeoning bougainvillea - admittedly about to go semi dormant January to March. Brenda’s ten year old calamondin orange will be heavy with oranges for another four months and very shortly will also carry flowers. We can count fifteen spikes on our orchids, three were in full flower for Christmas. Clivias which looked so tired when brought inside in early November have made vigorous green growth and now will be flowering for a three month period. All these plants need feeding in Winter. I do not wish to encourage you to fertilize your lawn in Winter, there are too many potential pitfalls. Never-the-less I would point out that most of those beautiful green pitches seen on Match of the Day receive Winter nutrition. I remember when our college hockey field looked very sparse in January and our turf lecturer arranged for a light application of a high nitrogen general fertilizer. With very good effect. Perhaps emboldened by my own careless talk, soil scientist Peter Williams last month applied a light application of a general fertilizer to his lawn. Peter does not use iron sulphate as a moss killer and his philosophy is that if the grass grows well there is no need. His lovely lawn in Winter has a golden sheen due to moss. You can have too much of a good thing and his grass growth was weak. (Grass does grow in Winter on warmer sunny days. In the UK we even sometimes need to mow). He applied a very low rate of even balance NPK at five gram per square metre. He is delighted with the new grass growth. He is considering applying a little more! I have provocatively asked him, bearing in mind that it is nitrogen in which his grass is deficient, why he does not go the whole hog and try a very light dressing of 20:10:10! On hearing of Peter’s ‘trial’ I rushed out and applied 30gram of Yaramila to a square meter of a pale patch of my lawn (marked by the plastic labels). In keeping with blogging and trying things new I applied my YaraMila general fertiliser to my asparagus in early February this year. I have never had such superb fat asparagus spears! We can't keep up with them. How do you look after your clivia? - I have one indoors that hasn't flowered for a while now. I have an easy answer to that Sue, just put clivia in my search box at the bottom of the blog its working again! Thanks for the promotion! I remember reading that before and should have taken more notice. So mine is in too shay a place, in too small a pot and too warm. The problem is that it looks so good where ot is with its dark green leaves! So I have a dilemma. Enjoy your dark green leaves! I've been thinking about this (I'm a slow thinker) and I started to wonder what reaction roots have to feeding. If a plant hasn't got enough light, it tries to find it by putting on lanky growth. So if a plant needs more feeding and/or watering, might it do the same with it's roots? In which case, might feeding and watering make it lazy, and not bother to grow much root? It would then be dependent on more feeding and watering. No digging, no feeding, no watering....any chance of no mowing too? You and your thinking Sarah! You always come up with something interesting! Your 'lanky growth' is called etiolation and is worthy of some future blogging! Yes I think you are right with roots, especially with regard to water. Roots grow towards water and if plants in summer are given regular shallow irrigation(bad practice), thats what you get - shallow roots. Probably with nutrients too they behave the same. Certainly applying fertiliser inhibits root mycorrhiza. As to the grass, I mischievously suggested that fertiliser might not stimulate new growth when it is cold but it certainly effects quantity of grass growth. I found myself cutting my lawn much more often after my September post about fertilising lawns when for the first time in two years I fed my lawn! Thought provoking post as usual Roger. I think it has been common practice for autumn planted subjects such as wallflowers and bulbs to have some fertilizer added at the time of planting often bonemeal, not one of your favourites, which I suppose could be termed applying fertilizer for winter. Personally, as long as growth is actually taking place I can't see anything wrong with applying fertilizer at any time of the year with the proviso that if there is freezing weather in the offing it is not wise to apply anything with too high a nitrogen content as when the new growth is hit by the frost it would be rather counter-productive. Growers took a risk with spring greens and some cold house veg as a commercial decision based on young early produce fetching a better price at market but I am not sure this is as relevant today with all the imports. Your commercial experience is valuable Rick. I think a lot of gardeners perk up their Spring greens with sulphate of ammonia.As you know from my posts I can't be doing with single nutrient fertilisers. As to your comment about bonemeal it is my next but one myth. I am sure you will be responding. You might be happier with the next one, the one you raised, not washing pots! So much good info in your post Roger. I too think it depends, like you, on the application of the fertilizer with respect to what is being fertilized. My houseplants are all that I use a commercial fertilizer on, but give them compost in the summer. And, you mentioned on my blog about the Cyclamen. Mine are indoor only plants. I guess the title and first sentence to the post confused others too. Sorry. I really like your Christmas display. The colors go perfectly together. It is nice you have both a greenhouse and conservatory. Plants came be many then. and the small porch Donna which is an intermediate temperature between no artificial heat at all and central heated comfort! I am easily confused, but don't apologise for your interesting post on your blog! Due to me having a car accident I was too poorly to take my geraniums out of their beds at the end of 2013. It is now March and they look fantastic so do I take a chance and leave them to see what happens by April/May? do I trim them and if so when? I live in Shropshire and they are in quite a sheltered spot being protected by hedges. Hi Dawn. Hope you are ok now. Leave yours out now Dawn you will be very unlucky to lose them now. They might still be a little weak because of poor Winter light as well as cold so give them a couple more weeks perhaps before you cut back the scraggy bits or take another batch of cuttings. Those that have overwintered will be superb this year. In keeping with this post give them a top dressing of general fertiliser now!